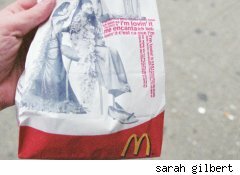 Is gaining weight an occupational hazard of working at McDonald's (MCD)? A Brazilian judge has ruled yes, at least in the case of a former franchise manager who said he gained 65 pounds in 12 years of working for the chain best known for its hamburgers. The 32-year-old man, whose identity wasn't disclosed, blamed the company's policy of mandatory food sampling and the free lunches McDonald's offered to employees, the Associated Press reported. Judge Joao Filho ruled against the company, ordering McDonald's to pay its former employee $17,500. "We're disappointed with this preliminary court ruling, as it's not an accurate representation of our highly regarded work environment and culture," McDonald's said in a statement. "This case is still a pending legal matter and it would be premature to draw conclusions at this time." The case could have broader implications for the world's largest restaurant operator if other employees also file suits. More than 400,000 employees work at more than 32,000 McDonald's restaurants in more than 100 countries.